Creative Edge Monograms | Embroidery & Screen Printing | Lincoln, Nebraska - Bling! There you have the dictionary meaning of “bling.” Today bling has been made popular by adding it to your apparel. Jeans, t-shirts, bags, etc. can all be decorated to look “flashy and glitzy.” Now you can personalize your apparel by adding some rhinestones of your choosing. You can use designs already created or create your own design. Bling is a fun way to celebrate an upcoming wedding. 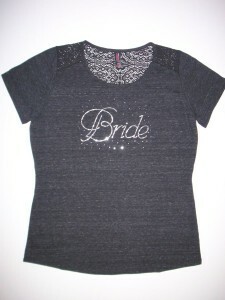 Decorate t-shirts for all the bridal party from the bride, bridesmaids, and flower girl to the mother of the bride and groom. These can be worn as you shop for the wedding or at the rehearsal. Glitz up a tote bag as a gift for your attendants or just for yourself. What little girl wouldn’t love a tote bag or t-shirt for her birthday?